This GORGEOUS 3/2 GRANTHAM Courtyard Villa sits on a corner lot in the BELMONT VILLAS within the convenient Village of BELVEDERE! This light, bright home has been gently lived in...just 3 months a year by the original owners & IMPECCABLY MAINTAINED! Enter through the LEADED GLASS front door, through the foyer and into the OPEN LIVING AREA. 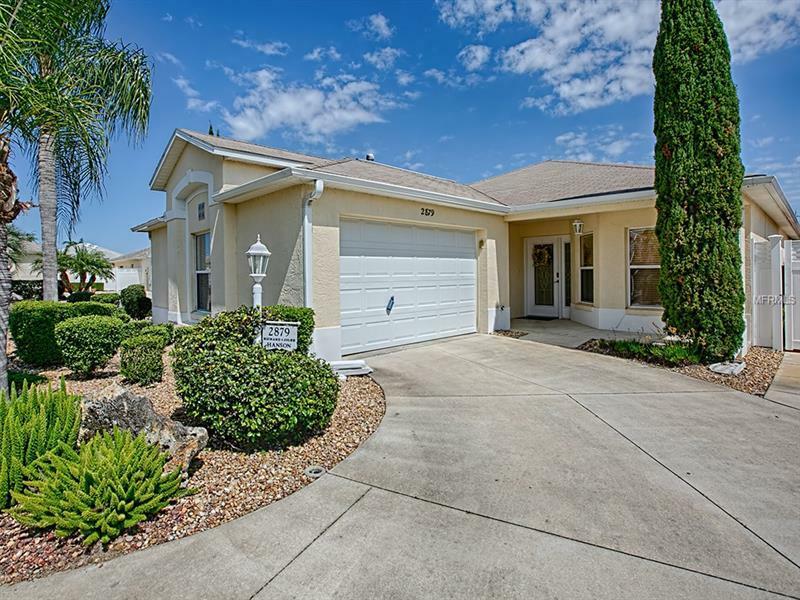 You'll be impressed with the beautiful HARDWOOD FLOORS that flow throughout the living area, hallway and bedrooms; TILE in the foyer, kitchen, baths and laundry room. The kitchen has "ABSOLUTE BLACK" GRANITE counter-tops, bisque cabinetry, upper pullouts and a generous pantry cabinet. The black appliances include a smooth-top electric range. Notice the CUSTOM PAINT in the living/dining room! The Master Bedroom has an en-suite bath with shower, a walk-in closet and sliding glass doors to the lanai. One of the two guest bedrooms is currently used as a DEN/OFFICE and there is a guest bath in the hallway. The INSIDE Laundry Room has extra cabinets for more storage & a utility sink. This garage features a CHATTAHOOCHEE RIVER ROCK floor, ample room for car & cart and an insulated door! An ENCLOSED LANAI leads to the AMAZING OUTDOOR SPACE! This oversized courtyard is totally LOW MAINTENANCE and NO GRASS to mow! The LANDSCAPE includes a painted patio and walkway, accented by a PAVER WALKWAY & 2nd PATIO. Pass through a "green" ARBOR and feel like you're in a "SECRET GARDEN" accented with trellises and beautiful plantings. Lovely Home and TURNKEY PACKAGE IS AVAILABLE SEPARATELY!